Sarah Nally, Ryan Cunningham, Felicity Heaslip, and Liam Ryan at the launch of Groveland’s OT challenge. 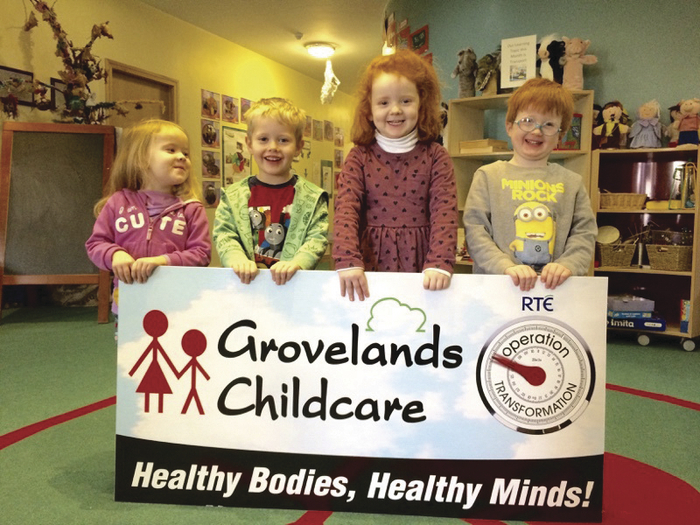 The staff of Grovelands Childcare Athlone are taking part in RTÉ”s Operation Transformation and are asking Athlonians to join them and take on the weight loss and fitness challenge. Group walks will take place every Wednesday for staff, parents, families and friends, beginning at 6.15pm at Grovelands Childcare Athlone centres and all are welcome to take part. Check Grovelands Childcare’s Facebook page to see which centre (IDA Business Park or Corran Riada ) the walk is leaving from on a given week. As part of the initiative children attending Grovelands Childcare will take part in three structured physical exercise activities each week and will put staff through their paces to ensure they stay on track! Healthy eating and the benefits of physical activity will be highlighted to the children during the eight weeks of the initiative. Staff would like to thank the Athlone Springs hotel which has kindly offered free gym membership and access to the swimming pool to all Grovelands Childcare staff who have signed up for the initiative for the duration of Operation Transformation. For further information follow Grovelands Childcare on Facebook.